Boeing have begun incorporating an “Additional Information” section at the end of some NNM checklists. Presently on the 777 this feature exists for the Ice Crystal Icing, Airspeed Unreliable, and Fuel Leak checklists. So you won’t see this information when you first open the checklist (paper or electronic). Strictly speaking since this information could be important to (a) identifying the need for the checklist; and (b) confirming that you have opened the correct checklist – you could easily be forgiven to skipping straight to the end to read the “Additional Information” once you’ve opened the checklist. While it could be easy to miss – the Electronic Checklist (ECL) being the clever beast that is it, doesn’t let you. 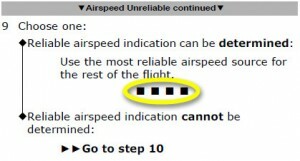 Even should you take an action that completes the checklist halfway through (see below for the Airspeed Unreliable checklist) – since the Additional Information is a “white” item in the checklist, this page (or pages) of notes remain at the end of the checklist, and you have to page through them. ECL has you covered. But what about Paper QRH? Being children of the Magenta Line, or in the case of ECL, the White, Green and Cyan checklist items – it’s easy to foget that there may come a day (quelle horreur!) when you might have to Dispatch Without ECL. In this case – what happens with the Additional Information section? The current case in point is the new Airspeed Unreliable checklist. 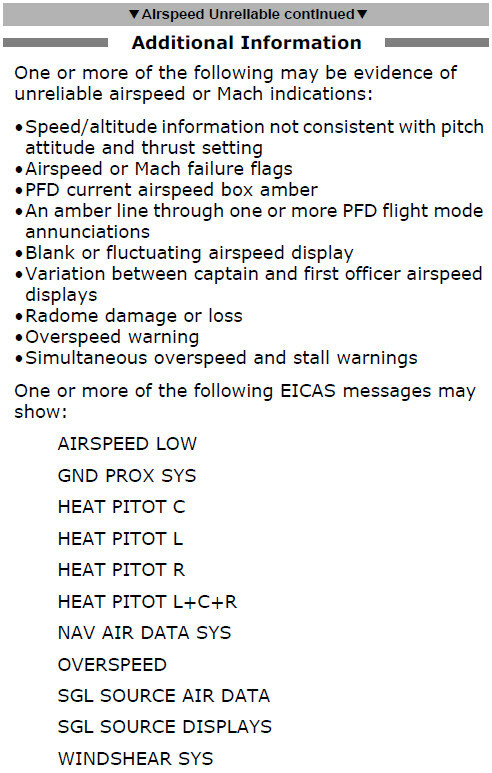 This checklist has essentially come about from the Air France 447 tragedy and reflects a total revision of the Airspeed Unreliable exercise – which has always been challenging, particularly to pilots of modern aircraft where perhaps not enough manual reversion is emphasised in training and full manual reversion almost almost never occurs, voluntarily or otherwise. I am writing a separate post on this new checklist and will place a reference to it here shortly. Basically you open the Airspeed Unreliable checklist and begin with the condition statement that apart from anything else – indicates that there is an Additional Information section. Moving through the checklist, you are eventually asked if a “Reliable airspeed indication can be determined.” If one can be – whether a Primary (PFD) or standby (ISFD) – the checklist ends. At this point you would be forgiven for thinking that the checklist is over – and indeed technically it is. However while the ECL takes you through this additional information (which is quite extensive) – with the Paper QRH you have to know to skip to the end and review it. I guess with the checklist over and the problem supposedly addressed, you could be forgiven for assuming you don’t need to read the additional information … but that’s another for post. In any case it can be seen that the Additional Information section for Airspeed Unreliable contains a treasure trove of information as to what you might already have and what you might expect to further occur as you carry the NNM to the runway. The lesson from all this is to be aware of the Additional Information prompt at the beginning of the NNM paper checklist, and ensure you get to read that section even if the checklist completes early.